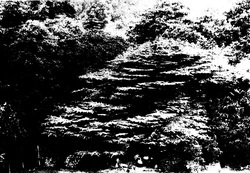 Taken from the 19th Century Photograph of the Cedar Tree in the Leigh Library Gardens, this peice reflects, memories and placement of how we percieve nature and loss. 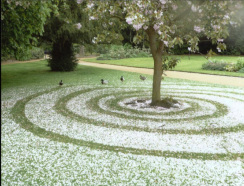 This piece was created from scented rose petals harvested from the grounds in chalkwell park Southend On Sea and was initiated by Joanna and devloped and completed by children shown in the picture. It brought scent and colour and playfulness into its creation. Created to reflect the passing of time in response to man's mark on the natural landscape. The first of the spiral pieces. A forty four day journey culminating in the creation of a labyrinth on Leigh Beach between first light and high tide June 18th 2011. Captured through journals, stop frame animation, blogs and memories. 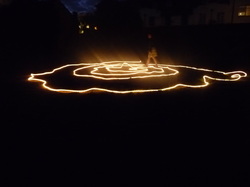 Rose Spiral was created using light to create a rose spiral - influenced by the natural spirals of life, rose spiral forms part of a body of work exploring journey. A small scale piece created using natural plant material commissioned by Essex and Suffolk Water for the inaugural Dinner on the Water Table which Joanna was one of the artists.